What if coaches would investigate more down the road of our human history? What if they allowed themselves to be vulnerable to the ways of how we escaped or attacked for survival? How would they think differently about speed? What if we asked the question, “Why were we given the ability to have speed and quickness?” What can we learn when we venture down that path? 1. Survival drives us through channels not so easily understood from a Central Nervous System (CNS) standpoint. We have to bow down to the subconscious effort that makes us move quickly on instinct or reflex. This is harder to understand, so we try to ignore it as a viable option for speed training. 2. Playing competitive sports actually taps into our CNS – or should I go deeper and say our “sympathetic nervous system?” This is where our heightened awareness of our surroundings kicks in. If I am caught in a rundown in baseball – or going to be tackled in football, or being chased during soccer i- it takes us to a level of effort we don’t commonly experience in our daily lives. 3. Our body kicks into what we call fight or flight: the survival mode. This occurs all the time during sports competition. It drives us to make incredible speedy plays. It forces us to react in such a way that our feet move quicker than our conscious mind can drive them. This is where I want to concentrate on for the rest of this article. I want to share with you strategies to make you faster! Plyo Step: The plyo step is an action that occurs when one foot is repositioned behind, to the side, or at any angle behind the body. This act quickly drives the body in a new direction of travel. Hip Turn: This is basically the same as the plyo step except the athlete turns and accelerate back away from the direction they were facing. Repositioning occurs to find an angle to push the body in that direction. Directional Step: Think base-stealing. The athlete will face sideways but turn and run. The front foot opens to be in a greater supportive position to push down and back during acceleration steps. The goal is to get into acceleration posture as quickly as possible to make a play when one of these repositioning steps occur. a. Simply have a partner or coach stand 10-15 feet away from the athlete with a tennis ball held out at shoulder height. b. The athlete is in an athletic parallel stance facing the coach, turned sideways, or back facing- depending on the drill. c. The coach will drop the ball and the athlete must accelerate to catch the ball before the 2nd bounce. I encourage the coach to use the command “Go” at the exact time of the drop to help when vision is not an option. The action you will see 99.9% of the time is a repositioning or a hip turn or plyo step (the directional step is the act of preparing the front leg for push off; it angles in the direction of travel). Perform this drill facing forwards for four reps, sideways for four reps, and backwards for four reps (2 to each side for the side-facing and back-facing). Perform this drill 2-3x per week to tap into the “fight or flight” response. In this drill, the focus is on reacting to either a partner (like a mirror drill) or the coaches signal to go right or left. a. 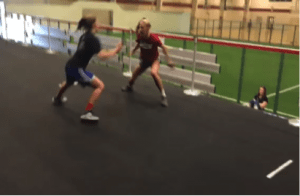 The athlete gets in a great defensive stance and prepares to explode to her right or left. b. The coach will quickly point in either direction. c. The athlete will create quick force into the ground in the opposite direction of travel. 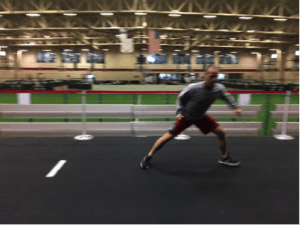 Typically, there will be a repositioning step unless the athlete starts in a wide stance where outward pressure is effective in the current stance. d. As soon as the athlete shuffles one to two times, he will shuffle back. e. The same drill is repeated, but now using a crossover step. 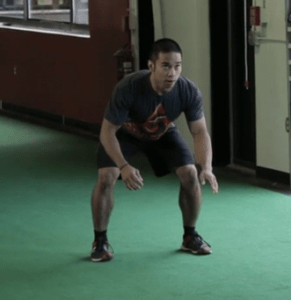 Perform 3-4 sets of ten seconds of both the shuffle and crossover drill. Allow 40-60s of recovery between bouts. The final skill I want to write about might be one of the most important “survival” speed skills an athlete can have. It falls under the “retreating” set of skills where the athlete moves back away from the direction they are initially facing. 1. The athlete must “stay in the tunnel.” Do not rise up and down; stay level. 2. By staying level, the immediate repositioning that takes place allows for a great push off angle to move the body in a new direction. 3. The athlete should attempt to create length and cover distance quickly. Short choppy steps are not effective when in “survival mode.” GET MOVING! 4. In the snapshots below, the athlete is performing a hip turn based on the coaches command or signal. The athlete will perform a hip turn and either a shuffle, crossover, or run – and then recover back to the start position as soon as possible! Perform 3-4 sets of 7-10s of work. If quickness/speed is the goal we want to do it in short bursts of time and not long duration where speed in compromised. Recover for roughly 45 seconds and repeat. Now, I know it sounds kind of crazy to be talking about survival, cavemen, and “fight or flight” when we are referring to speed, but we have to always look at the genesis of all things. Animals that don’t have reactive speed have other ways to protect themselves. Humans have intelligence and the ability to escape or attack using systems derived out of our CNS to help us use our speed. Our job as coaches is to tap into this ability and use it to help our athletes “naturally” move fast! 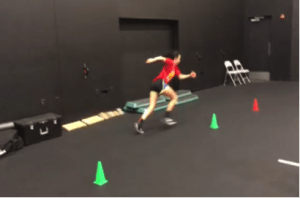 This entry was posted in Fitness and Performance, Speed Training, Sports Performance Training, Strength and Conditioning, Youth Athletic Training, Youth Performance Training and tagged Agility Training, K2, Performance, Sport, Youth Athletic Development. Every coach and/or training center will have a training culture, and it’s important to find the right fit. A culture will contain many things, but young athletes thrive in an environment that encourages fun, positive attitudes, respect and builds self-confidence. This is especially true for athletes under 14 years old. At this age, it’s important to enjoy the training process so athletes look forward to a more intense environment in the future. Pushing kids too hard – both mentally & physically – at an early age usually results in athletes who dislike training and will often lead to burnout and quitting. Look for a positive atmosphere where you see plenty of high fives, smiles and coaches “building kids up.” You should see positive reinforcement from the coach and plenty of teaching/instruction. Between 12-14 years old, you might see a more intense sports performance program but the underlying culture should remain the same. There should always be a positive environment with coaches who serve as role models. Athletes should feel good about what they’re doing and praised for their effort. The culture is a direct representation of the coach/owner and and the overall intent of the program. Avoid negative attitudes, high-pressure sales, or unrealistic promises. Not everyone will be attracted to the same culture, but make sure the kids feel comfortable because they’ll be spending a lot of time there. If there are no quality trainer centers near you, or you simply can’t afford it, find a place that accommodates your needs. This may be a home gym, school weight room or local gym/recreation center. You’ll need adequate space and equipment depending on your goals, so find a place that will suit your needs. How do things work with the coach or facility? How do you schedule appointments? 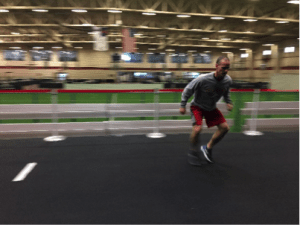 What is the coach: athlete ratio? How are the athletes grouped? All participants in a sports performance program should have the opportunity to thrive in a training environment, and good administration makes sure everything is well organized. This will ensure that you’re engaged with professionals who take this important job seriously. Have you heard other people talk about training at a facility or with a coach? What was their experience? Have other athletes had success with the program? Athletes who have gone through a program should have positive things to say about it. Do a little research to see what kind of track record a program has. Testimonials are helpful, but talking to someone you know can give you even more insight. When observing a class you’ll want to see participants of similar ages/abilities together and interacting appropriately. This does not mean that every athlete in a group needs to be the same age or play the same sport, but the training goals should be similar or the coach should know how to modify the program for each athlete. Cookie-cutter programs aren’t always bad, but an individualized approach is always preferred. Look for a relatively low coach:athlete ratio. A good coach can easily handle 20+ athletes in a team environment, but there should be a much lower ratio for a more individualized program. Smaller groups ensure more individual feedback, but most athletes thrive in groups. This is especially true for young athletes so that games and group activities can be utilized. A 1-on-1 session for a 9 year old has the potential to get pretty boring for the athlete. Being in groups also gives young athletes the opportunity to develop character traits such as leadership, teamwork, giving encouragement, empathy and respect. These things are much easier to address in a group setting. Quality coaches are the most important thing to look for in a sports performance program. Coaches pretty much make or break a program, so make sure you’re with a good one. Not only will a good coach get performance results, but they should also address things like motivation, mindset, respect and the value of hard work. Make sure that your coach is certified from a well known & respected organization such as the IYCA or NSCA. He/she should also have experience coaching athletes, and a proven track-record of producing results is definitely preferred. A degree in a related field (kinesiology, exercise science, physical education, etc.) is highly recommended, but there are a lot of exceptional youth coaches who got their education after receiving a college degree in an unrelated field. The coaches should have positive energy, be strong role models, and truly enjoy helping athletes develop. Like culture, people are drawn to certain personalities or coaching styles, and it’s important you find the right fit. Have a conversation with the coach or staff to see if you get along and more importantly if your child gets along with the coach. The coach has to earn your trust as does your child. This trust will allow for proper growth of the athlete and continual trust in the program will also allow the coach to push the athlete to their potential. Try not to get overwhelmed by past athletic accomplishments or a coach’s physique. While certainly not negatives, these things don’t necessarily mean he/she has the educational background or coaching ability to help you. It usually helps to have a coach who has some degree of athletic experience, but this should not be their #1 qualification. Some coaches are able to really utilize their experiences to benefit young athletes, while others were simply born with talent. So, take it into consideration (because it’s important), but try not to let it cloud your judgement if nothing else feels right. If the facility has a large staff, don’t hesitate to request a coach your child loves, or ask to NOT train with someone your child really doesn’t like. This may not always happen, but a good program will make an effort to accommodate your needs. Disrespectful or inappropriate comments or actions are a definite red flag. Having a negative coach in a child’s life can cause tremendous stress and can hard a child’s self-esteem and enjoyment of the training process. While it is sometimes necessary to be firm or have difficult conversations, good coaches can handle tough situations professionally. Athletes who don’t live anywhere near a training facility now have online options available that will allow you to train at home. While this option may not be as optimal as having a live coach, it’s often the only option available. It can also be much less expensive and more convenient, so there are certainly reasons an athlete may choose to train alone. Finding a great home-based sports performance program can be tricky, because every trainer with a web-site or social media presence may tell you this is an option. Just like looking for an in-person trainer, look for credentials, experience, values, and a proven track record. Make sure you have the equipment necessary to complete an at-home program. We’ll discuss at-home programs in much greater depth in the future, but consider it a second-tier option. The actual training program is critical, but usually difficult for parents to truly understand. You won’t know precisely what the program will include, which is why it’s so important to find a qualified coach. At a minimum, a good sports performance program should be very safe and organized. Sure, accidents happen, but a young athlete’s health is top priority, so they should never be engaged in anything dangerous. In general, if it doesn’t look safe, it probably isn’t. Kids may get sore and tired, but they shouldn’t sustain injuries from a training program. The program should have a basic level of individualization, or at least include the opportunity for modification when appropriate. Most young athletes have a lot of the same needs, so there will be a great deal of similarity between programs for athletes, but the program should be flexible enough to address individual needs when needed. Most programs will address strength, running mechanics, jumping, fitness, mobility, agility, and coordination. Make sure the program is meeting your individual goals and that the coaches modify their program to help achieve those goals. At the very least, you should be able to receive an explanation of how and why the program will help work toward your goals. There should be a great deal of teaching, instruction and feedback given, and there should be a progression to everything that is done. This means that the program will gradually get more demanding. The weight lifted, the volume of overall exercise and the intensity of the drills should gradually increase. We know that progressions or progressive overload is key to not only a younger athlete but more importantly to all athletes. Progressive overload is the principal in which each week you are progressively getting stronger our advancing toward a new technique. There should not be an emphasis on how much you can lift but how much progress is being made. There is an old saying that the program should have the athlete conform to the program but the program should conform to the athlete. You want to ask questions about the program including expected results and core values in programming. There should always be some sort of assessment to determine needs and establish baselines. This assessment will vary, but the coach should talk to you about the results and formulate a program based on those results. 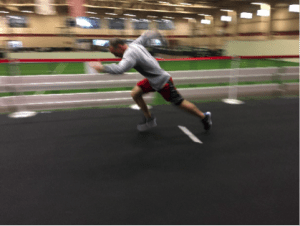 An assessment like the IYCA Big 5 or FMS will help find deficiencies and areas of concern, and a performance assessment will help establish baselines and give the coach a better understanding of how the athlete moves. It’s always great if there is a movement analysis using video of the athlete performing various movements. While the programs will vary greatly, it helps to hear about results from other athletes and ensure that the coaches are qualified. Again, if you are looking for an at-home program, be sure you are getting what you need. Don’t try to replicate a D1 college football program with an 11-year old kid who has never lifted weights. Find a program that is specific to your goals & experience level, has delivered results, and is created by an experienced coach or organization. 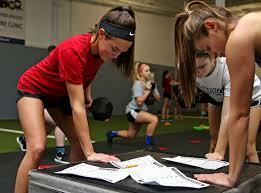 Goal setting is crucial for any athlete, and it should be a part of a sports performance program. Make sure that your goals align with the facility and their goals for you child. Training is an investment of time and energy, and it’s not uncommon for young athletes to spend several years training at a facility. You want to make sure they understand your long-term goals, so they are invested in your success and development. For example, there are some facilities/programs that focus exclusively on strength development. If your goal is to run faster, this is probably not the right place for you. Typically, a sports performance training program will be able to address multiple goals – speed, strength, mobility, conditioning, etc. – but you want to make sure to ask if there is a program to specifically address your goals. Teaching goal setting, and the process of working toward goals is a skill that will serve athletes well in all facets of life. Let them dream, let them strive for success. In a world so based on technology, having goals can help set them up for success. It’s even a great idea to include non-sports related goals such as academic or personal goals. Remember, a student-athlete is always a student first, so keep that in mind when setting goals. 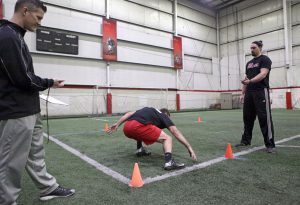 Selecting a sports performance program or facility is an important choice – perhaps more important than you think – and there are many things to consider. The five components outlined here should help in your decision-making process. 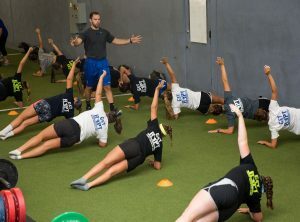 From the culture to the facility to the coaches themselves, you want to make sure you find a place that is comfortable, fun, engaging and creates programs that help the athlete move toward their goals. Ask questions, talk to others and hopefully, you’ll end up finding a comfortable fit for a long time. About the Author: Brad Leshinske is the founder of the Athletic Edge Sports Performance program in Chicago and an adjunct faculty member at North Park University. He has more than 10 years of experience training athletes of all ages and at every level of competition.